The production process of the Composite blades is based on a new technology in the aircraft construction sector and guarantees high resistance and extreme precision. The two different types of steel are manufactured separately and then connected through a particular operation using liquid copper brazing. The steel grades are manufactured separately and then connected in a subsequent operation using liquid copper. The subtle copper line remaining between the steel grades adds an additional special touch. Already the recipient of several design awards, the Seki Magoroku Composite Series is the symbol of contemporary design expertise from the house of Kai. The series combines dynamism and lightness. The resulting appearance is impressive and makes the blade a highlight of Japanese blacksmithing. 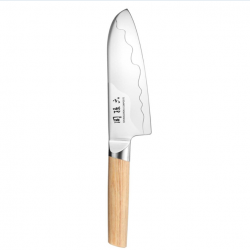 Utility knife.Overall length: 24.5 cmBlade length: 15 cmHardness: 61±1 HRCHandle length:&n..
Nakiri is Japanese for: vegetable chopper. The Nakiri blade shape is traditional for Japanese vegeta.. Chef's knife.Overall length: 32 cmBlade length: 20 cmHardness: 61±1 HRCHandle length: ..
Small slicing knife.Overall length: 30 cmBlade length: 18 cmHardness: 61±1 HRCHandle lengt..
Slicing knife.Overall length: 35 cmBlade length: 23 cmHardness: 61±1 HRCHandle length:&nbs.. Bread knife.Overall length: 35 cmBlade length: 23 cmHardness: 61±1 HRCHandle length: ..